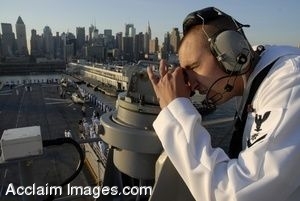 Description: Clip art photograph of U.S. Navy Quartermaster 3rd Class Chris Lee stands bearing taker watch as the amphibious assault ship USS Iwo Jima (LHD 7) pulls into New York for Fleet Week 2009. Approximately 3,000 Sailors, Marines and Coast Guardsmen will participate in the 22nd commemoration of Fleet Week New York. (U.S. Navy photo by Mass Communication Specialist 2nd Class Joseph R. Wax). Clipart photograph by Department of Defense Public Domain.